After months of anticipation, Stephen and I finally had the chance last weekend to attend our I Wish sushi-making class, which we discovered through a Living Social deal way back in October. Held at a charming community center in DC’s Eastern Market quarter, the class definitely didn’t disappoint, and we left armed with all the knowledge we'll need to start rolling our own Maki sushi at home. Here, a few highlights from our session, plus some of the key tips and tricks we learned throughout. We arrived to find our workstations already set up and stocked with everything we'd need to make sushi rolls, including Nori seaweed wraps, bamboo mats for rolling, and fresh bowls of water, since – as we soon discovered – it is absolutely impossible to properly handle sticky rice without first having a wet hand. Out of the three rolls we learned to make, the cucumber roll and spicy tuna roll were definitely the easiest, since both the rice and ingredients went directly inside each roll. To make these two, we started by first spreading sticky rice across the lower half of a Nori sheet, making sure to use the rough side, rather than the shiny side. 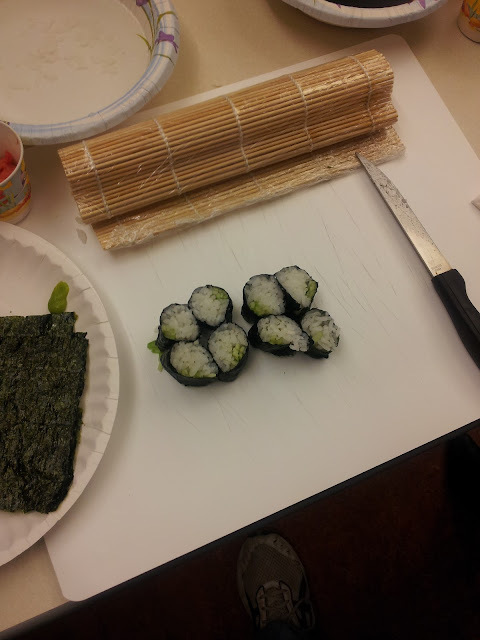 We then added our desired ingredients and used a bamboo mat to roll up and seal the sushi. After letting it sit for a moment in order to fully seal, we then practiced properly cutting the roll, first once down the middle and then into equal-sized smaller pieces. When using tuna or any other type of raw fish, we also learned to always make sure it has been flash-frozen at -4 degrees Fahrenheit. Above that temperature, our instructor said, regardless of how fresh the fish might otherwise be, it has not gotten cold enough to effectively kill any parasites. The California roll, which we filled with avocado and crab stick, was a bit trickier to execute, especially because the rice had to this time cover the entire rough side of the Nori, rather than just half. 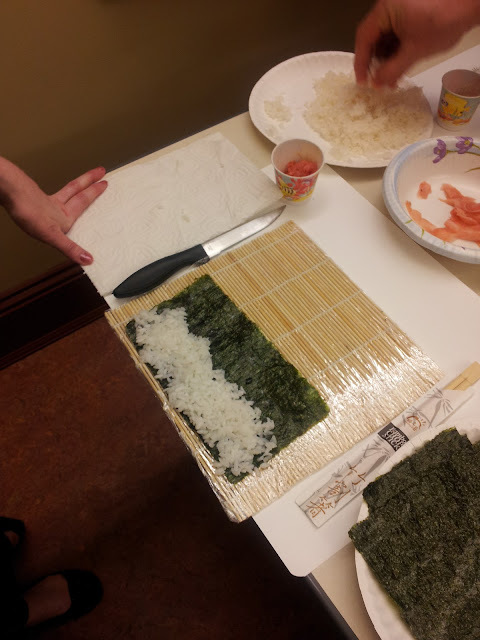 After completing this rather messy step and adding the desired amount of sesame seeds, we were then instructed to flip the Nori and add our ingredients to the inside, again using the bamboo mat for rolling once we were ready. Even though the thickness of the rice on the outside made this type of sushi tougher to roll and also harder to cut, I thought we still did a pretty good job overall, if I do say so myself! What do you think? Have we missed our true calling, or what? :) We both had such a great time learning the basics – and eating the results – that we've since bought the necessary tools and ingredients to start experimenting with veggies rolls and California rolls on our own this week. It should hopefully be fun and definitely very tasty! 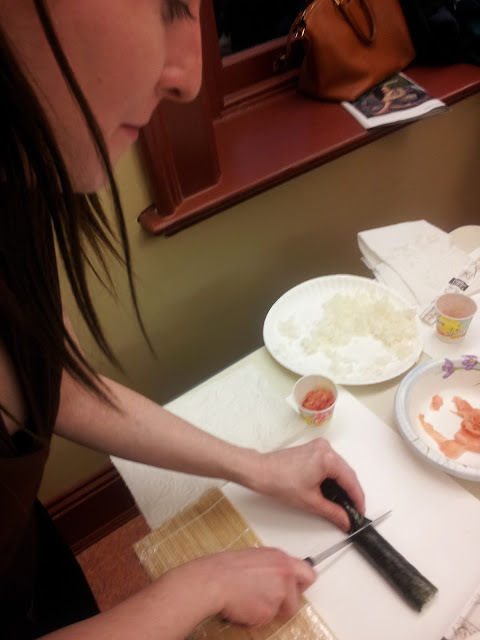 Have you ever made sushi or taken any other type of cooking class? looks awesome... i want to try this soon! Looks like a lot of fun to make! Yum! I love sushi and homemade sushi rocks! So cool! 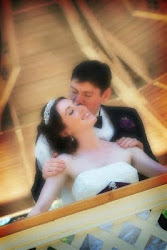 I wish I did this more; we even got sushi dishes for our registry gifts. You guys are WAYYYYY better at cutting them than I am for sure! Yum! this looks like such a fun class! I love making sushi at home. I make it a "date event" with my husband. And we just go CRAZY on the fillings! We make homemade sushi all the time! I think its a great way to experiment in the kitchen with non-traditional sushi foods. My favorite is avocado and mango, but a sweet potato roll is to die for. How fun! California Rolls are my favorite, with plenty of wasabi! Glad you guys had a great time - this is such a fun activity to do together! Ive never tried sushi at home, but this is so cool! Also, I LOVE the Eastern Market area, it is one of my fave neighborhoods in DC. I used near there and just loved the vibe of it. Wow, I'd love to learn this!! Not much of a cook, but love eating..LOL! Hope you are having a wonderful day! i tried once to make them but never got it right... ugh! I love Sushi but never made it myself, but my parents do every now and then. Looks like you guys did a fantastic job! I thought that picture was yours, but for the life of me couldnt find thte email to double check (I had saved all the attachements last week). I fixed it and linked you, thanks!! How neat is this?? So glad you took pictures!! Looks like it was fun! I have, however, eaten California rolls that Mr. A made! This class looks like SO MUCH FUN! I wouldn't even know where to begin making sushi, but this makes it look sort of accessible..though I would still need a class. My hubby doesn't eat sushi though :( so I'd have to take this class solo or with my mom! How fun! I love making sushi - one of my friends and I have sushi nights once in a while and make a big adventure out of going to the asian market (so much fun stuff there!)! 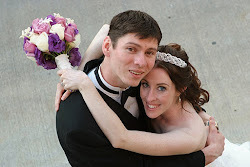 Discovered your blog from Kate's spring photo post and just love it! thanks for sharing! i love sushi and really need to try and make some at home. your california roll looks delicious!